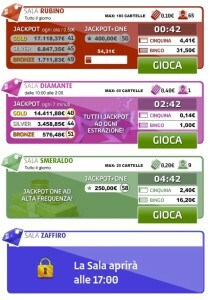 Our Bingo Platform is simply the best and most advanced bingo in Italy. We bring the experience of entertainment at the highest levels with a more complete set of features among all the products, including revenue enhancing like autoplay or pre-purchase, as well as unique locally tailored solutions , such as choosing your numbers or the dialect of the speakers (not all Italians talk the same language!). Being by far the market leader , played by over 1/3 of the market, our Bingo allows customers to have the greatest tombola and jackpots (the main attraction for Italian players) and a great variety of different rooms with different prices and a variety of unique jackpots. mobile versions are also available (iOs and Android platform).